The Elysian concept is born. The Elysian Private Event begins, followed shortly thereafter by the Elysian TGE. Team Expansion; Launch of the official Desktop Wallet (Windows, Linux & Mac). Launch of the official Mobile Wallet (iOS & Android). Private blockchain implementation for data storage. Launch of the official Elysian Merch Program. Launch of the official Elysian Platform. Atomic Swap integration into the Elysian Ecommerce platform. Expand the range of altcoins accepted on the Elysian platform. Opening of a Strategic Office in Europe. Opening of a Strategic Office in Asia. AI integration into the Ecommerce platform. VR integration into the Ecommerce platform. 1% of the global Ecommerce websites start using the Elysian platform. The primary role of Elysian is to create an Ecommerce platform to transform the industry by improving security and creating a unique user experience. Elysian will be the first Ecommerce platform to combine several vital aspects that are necessary for the progression of the industry – blockchain technology to securely store data, cryptocurrency to securely store & transfer value, and artificial intelligence combined with virtual reality to set a new precedent in user experience. 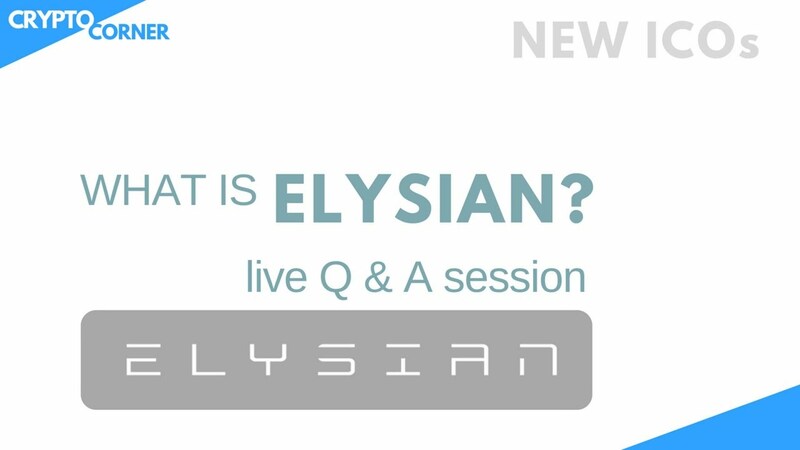 What is the problem Elysian is going to solve? Elysian will provide a platform to improve security and prevent data breaches, exemplified most notably by Equifax and Target. Elysian will also integrate futuristic technology to create an unprecedented user experience, leading to increased efficiency and consumer satisfaction. I bought ELY tokens, where can I see my balance? https://www.orderbook.io This is a secure exchange that has many different functions available for tokens. Are the tokens instantly transferable? Tokens are delivered to the user instantly during the public event and they become transferable one week after the TGE. Can I mine ELY with a GPU/ASIC? No. There is no mining. What happens if all validators are offline? No transactions can be executed and the blockchain comes to a halt. What happens when a fork occurs? Forks can not occur since Elysian has control over all block makers. How do I become an Elysian/Elycoin validator? To become a validator on the Proof-of-Authority blockchain, an organization/individual needs to join Elysian Global Corporation as an affiliate. Affiliates may run “authority” nodes, which means they are entitled to validate and sign blocks.